Microsoft has been pretty good at offering the world a peek at what Windows 10 will look and feel like when it arrives later this year, but you'll have to dig a little deeper to find out what the newly rebranded Music app will look like. Earlier today, Twitter user @BrownieTrav (via The Verge) turned up an Xbox Support page that appears to offer a closer look into what Microsoft has planned for the all-new Music app coming with Windows 10. At first glimpse, the overhauled user interface with a darker theme looks suspiciously like a screen capture from Spotify, rather than the current version included with the Windows 10 Technical Preview, which is largely unchanged from Windows 8. But the new UI will also look familiar to anyone using the Xbox app for Windows 10, part of Microsoft's overall unification toward white and black as the primary colors used throughout the revamped operating system. The support document notes that users of the Windows 10 Technical Preview will be required to search for the new Music Preview by name in the Store, which will be installed alongside the standard Music app for the time being. 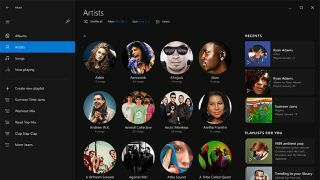 In addition to displaying songs ripped from a CD collection, copied to OneDrive or purchased from services like iTunes, the Music Preview will also display user playlists as well as "millions of songs in the Xbox Music catalog." Microsoft expects to release Windows 10 to the general public sometime this summer (presumably late July) in 111 languages and 190 countries.